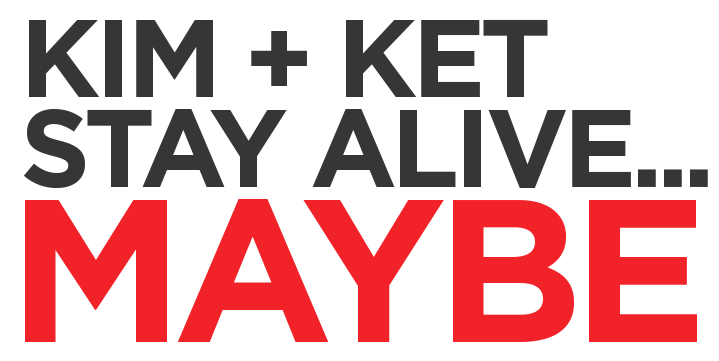 Kim and Ket Stay Alive...Maybe? visit our patreon for amazing perks! NEW MERCH AVAILABLE NOW IN SHOP! Kim tells Ket about the terrifying Terrifier starring David Howard Thornton, Jenna Kanell and Samantha Scaffidi. This one was a doozy, #sammies. The girls added several entries to their survival guide. They explained the very real perils of wearing one-piece outfits in public bathrooms and they will fail at answering the question “what IS this building, though?” Most importantly, we’ll learn if Ket will live or die in Terrifier. Ket tells Kim about The Forest starring Natalie Dormer and Eoin Macken. We’ll say “goodbye” to KKSAM podcast because the girls are starting a Funeral Moonbounce business that is going to be v. v. lucrative. (J.K.) The girls will find a new level of night beyond “night night”: TRIPLE NIGHT! And we’ll all meet a new member of Baby Burpsmap’s family tree. 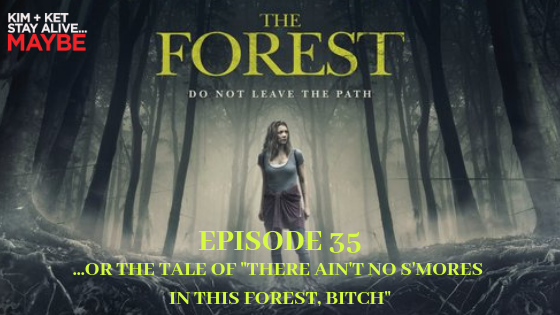 Most importantly, we’ll learn if Kim will live or die in The Forest. 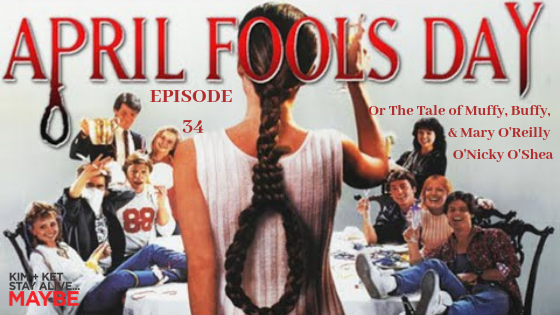 Kim tells Ket about the classic April Fool’s Day starring Deborah Foreman, Griffin O’Neal, and Clayton Rohner. We’ll learn that Ketryn does not like April Fools pranks… unless she’s the one playing them. The girls will tell the story of the “Birth of Cinq,” and they’ll reluctantly answer some very revealing 1986 Cosmo quiz questions. Most importantly, we’ll learn if Ket will live or die in April Fool’s Day. Ket tells Kim about the Shudder Original, The Witch in the Window starring Alex Draper, Charlie Tacker and Carol Stanzione.. Kim meets a KKSAM celeb from episode 10. Ket laments her inability to see whatever image was in those magic eye posters. Both girls praise the holy universe that documentation of the indiscretions of their youth was far more sparse than it is today. Most importantly, we’ll learn if Kim will live or die in The Witch in the Window. 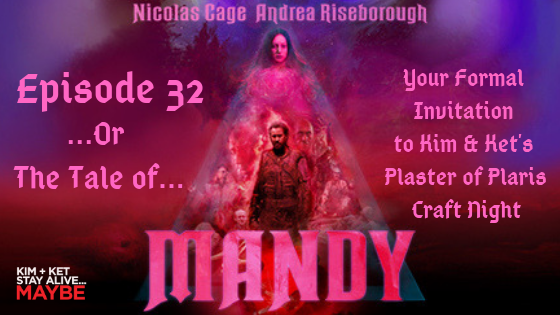 Kim tells Ket about the acid trip that is the Shudder original, Mandy, starring Nicolas Cage (Icolas Age) and Andrea Riseborough. Ket enlists The #Sammies to join the “Keep Kim Out of a Cult” mission. Kim cannot, under any circumstances, remember the name for a crossbow. They’ll both end the episode completely high. Most importantly, we’ll learn if Ket will live or die in Mandy.